For 20-year-old Ben Norton, working in the engineering industry is his dream career. 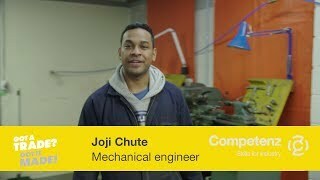 The mechanical engineering apprentice at Compac Sorting Equipment, Auckland is in his third year of his apprenticeship and loves every minute. “By the end of each weekend I look forward to heading in to the engineering workshop on Monday. I get paid to pursue and learn more about my passion every day,” says Ben. An unfortunate turn of events for his family turned into an opportunity for his father. “My father was made redundant in late 2014. I was able to recommend him at work and organise a trial for him. Everyone admired his attitude and ability and he was quickly made permanent as a factory assembler,” he says. A former Macleans College student, Ben took engineering unit standards at school which fuelled his passion for the industry. “When I was picking my subjects for school, I was weighing up between computing and mechanical engineering. I listened to my mum who said, ‘why not try engineering? You make something you can keep forever. You might find you don’t want to be on a computer all day’. I thought – why not? And I’m certainly glad I did,” he says. Now at the tail end of his apprenticeship, Ben is using his skills and experience to inspire others. “Towards the beginning of my apprenticeship, I was invited to give a presentation at Auckland University of Technology to share my story about how my time at school prepared me for my apprenticeship, as well as the benefits of doing an apprenticeship to an audience of teachers, lecturers and apprentice managers. I received a ‘BBQ Award’ from the owner of Compac Sorting Equipment for my efforts,” he says. Ben is thankful to the team at Compac for all their support. “I’m grateful to Compac Sorting and my Production Manager Andrew Jackson for seeing the potential in me, and giving me this amazing start to my engineering career,” he says. Ben is a Got a Trade? Got it Made! Future Business Leader.